One in six couples suffer with infertility and/or miscarriage. Though every situation is unique, the RAD team has achieved thousands of success stories over the past 16 years. 1) Learn all we can about our patients. We devote a great deal of consultation time and hands-on efforts to thoroughly understand important problems. Careful diagnostic testing usually identifies specific factors, and avoids expensive shotgun treatments. Our patients rarely have “unexplained infertility”. 3) Age really does matter. For women, fertility starts to decline after age 30 and by age 35 one in three women will have infertility. By age 40, 60-70% of women will have trouble conceiving, and 40-50% will miscarry once pregnant. After 6 months of attempting pregnancy, 75%-80% of couples should be successful on their own. After that, fertility challenges are much more likely. About 60-70% of our patients have a history of pelvic pain, significant menstrual cramps, and bowel or bladder symptoms. A disease known as endometriosis is now an epidemic, causing both infertility and pelvic symptoms. Fertility is often restored once endometriosis is treated. 6) Abnormal or irregular bleeding matters. Uterine fibroids, polyps, and polycystic ovary syndrome (PCOS) are extremely common and treatable. Approximately 50% of our male partners have significant sperm issues. 8 ) Laparoscopy is not the same everywhere. Our 2-physician restorative surgical approach is unique, uses no stitches, and uncovers key problems over 95% of the time. This is how we successfully treat pelvic pain, endometriosis, fibroids, and polyps. 9) Insurance often covers more than you might think. Major insurers usually cover consultations, testing, and laparoscopy. Our RAD team checks everything out beforehand and works as your advocate. 10) IVF isn’t always necessary. Over half of our patients become pregnant without needing IVF. But new IVF technologies commonly have a 70-80% chance of success, and often after just one attempt. 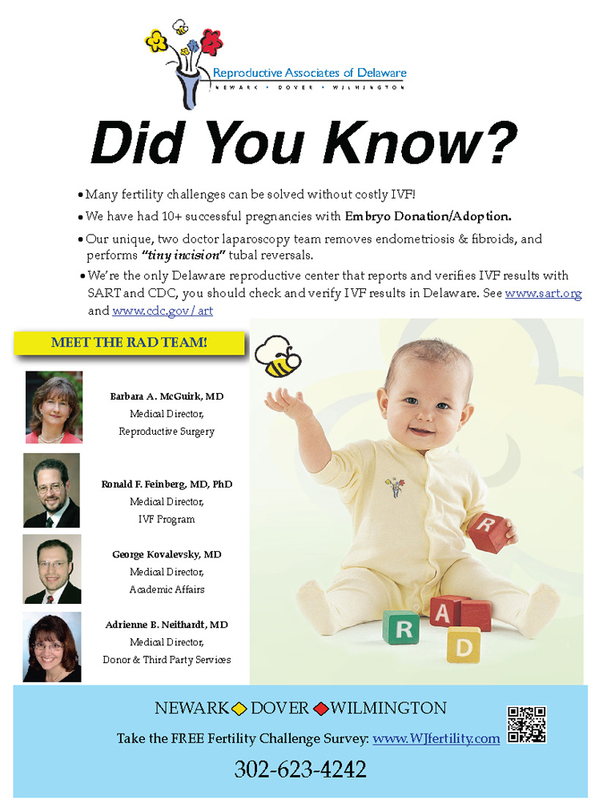 Exciting new embryo genetic tests at RAD dramatically improves success, minimizes miscarriage, and eliminates the need for implanting multiple embryos. Dr. Barbara A. McGuirk – Medical Director, Reproductive Surgery, Board Certiﬁed: Reproductive Endocrinology and Obstetrics and Gynecology. Dr. Ronald Feinberg – Medical Director, IVF Program, Board Certiﬁed: Reproductive Endocrinology and Obstetrics and Gynecology. Dr. George Kovalevsky – Medical Director, Academic Affairs, Board Certiﬁed: Obstetrics & Gynecology, Board Eligible: Reproductive Endocrinology. Dr. Adrienne B. Neithardt – Donor and Third Party Services, Board Certiﬁed: Reproductive Endocrinology and Obstetrics and Gynecology. Reproductive Associates is proud to have some of the ﬁnest and brightest endocrine and andrology lab staff, Linda Morrison, MT, MBA, Stacey Carney BA, TS., Cai Wang MD, Caitlin Boylan, BS and Katherine Shelly, BS who are led by our Lab Director, Marc Portmann, M.T., MHA. Our facility is also home to four of Delaware’s ﬁnest practitioners: Nancy Lorber, CRNP, Melissa Aiken PA-C, Rhonda Wright PA-C, and Susan Carr, CRNP. Silverside Medical Plaza in NorthWilmington. Please call 302-623-4242 to make an appointment. ← Previous Story Have You Heard The Latest Buzz? Next Story → Can My Smile Be Saved?